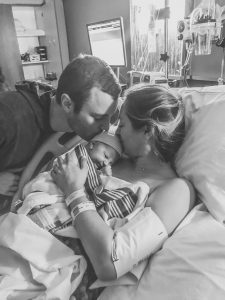 Though Blake and I aren’t certain this will be our forever home, what we do know is that it’s where we see ourselves for the foreseeable future. 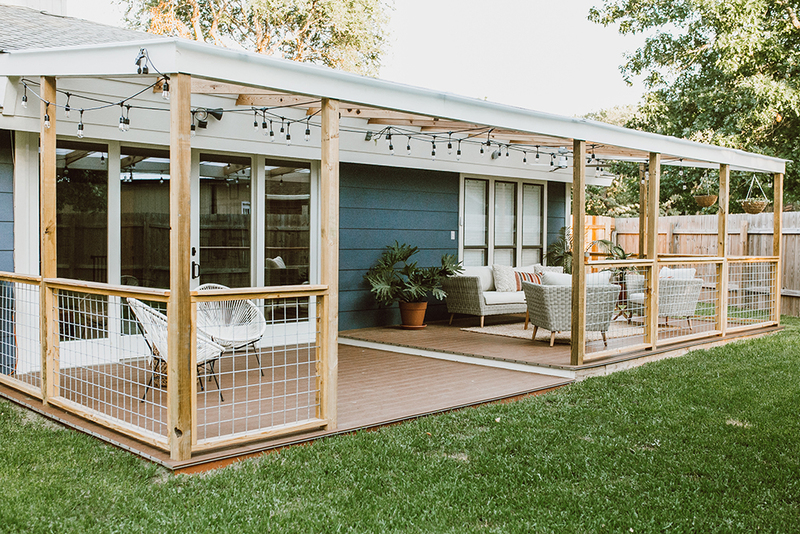 Thus, we were really excited to invest in a big renovation that would ultimately provide a ton of joy and transform the living room and our backyard. After living with the new space for a few months now, we are SO glad we made the changes. Even though it’s a bazillion degrees in Austin right now, we still pretty much live on our back patio. 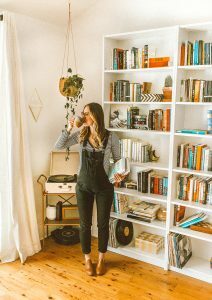 It’s where we have coffee in the morning while Watson plays, where I can escape midday (working from home has its pros and cons haha), and where we enjoy a drink as the sun sets. In sum, I give two thumbs up to this renovation! PATIO COVER: This is a combination of cedar wood planks (they age beautifully!) and opaque Polygal plastic (also known as Polycarbonate Sheets). Above all, we wanted to keep the natural light flow from the patio and into the house. 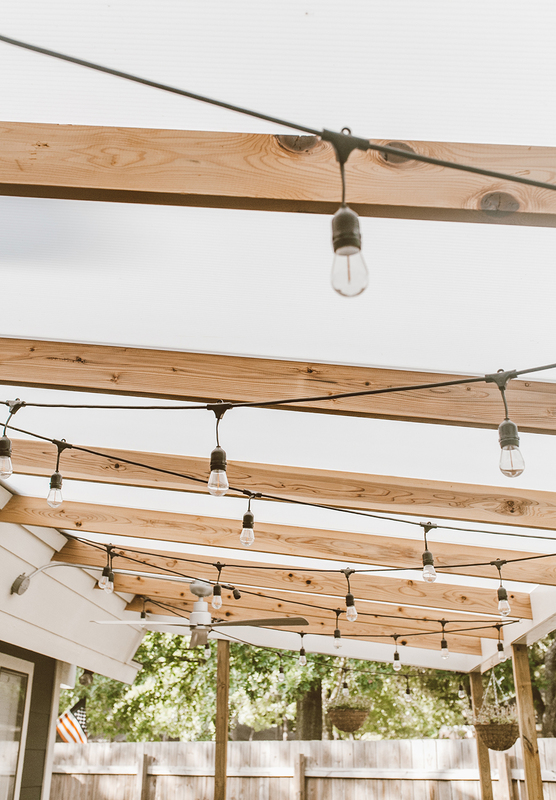 Although I adore the look of a fully covered patio with a roof extension, that design simply wouldn’t provide the light I wanted both inside and out. After chatting with our contractor about options, he showed us some previous patio work he’d done with Polygal – immediately, we were sold. Polygal is an extremely durable, high quality type of plastic that a lot of builders use for patio roofing, garage doors (there are some gorgeous modern ones out there!) and other various home projects. Our contractor provided both clear and opaque samples, but we decided on opaque. It’s weatherproof and looks incredible, too! 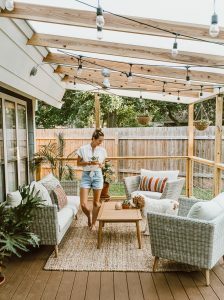 I think the Polygal adds such a relaxed vibe and really provides an inviting, open feel to a covered patio. 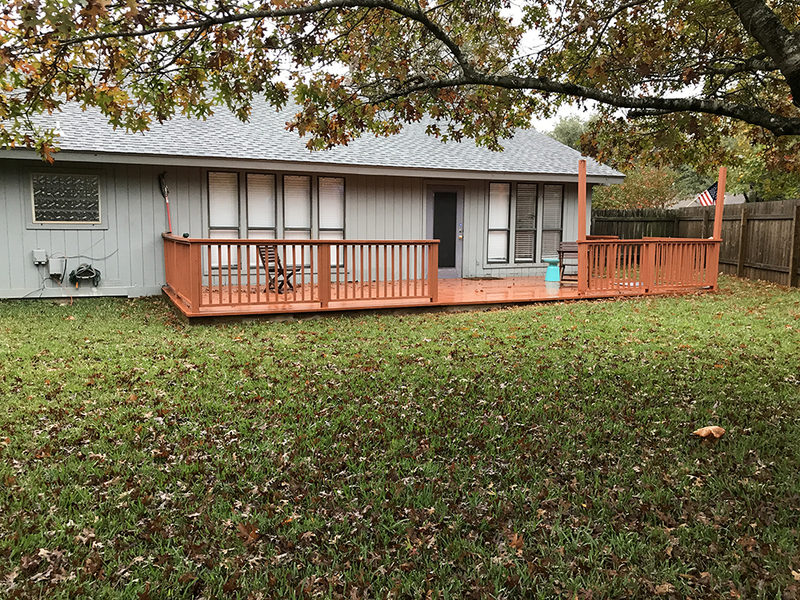 DECKING: When we moved in, the deck of back patio was extremely warped and painted the strangest red/orange color. Apparently it was only two years old at the time of move-in, but it was already deteriorating rather quickly. When looking at new deck options, we wanted something that would last a very long time and be able to withstand lots of foot traffic (from Blake and I, our puppers Watson and kiddos, one day!) and that also would look really beautiful and natural. Composite decking was brought up in conversation and after learning about how long it lasts, we added it to our list of changes. Though it’s more expensive than wood, most manufacturers offer a 25-year warranty (um, amazing!) and the best part? A simple wash-down once a year is all the maintenance you’ll be needing. Zero warping, staining or splintering involved…and that’s a total win in my book! 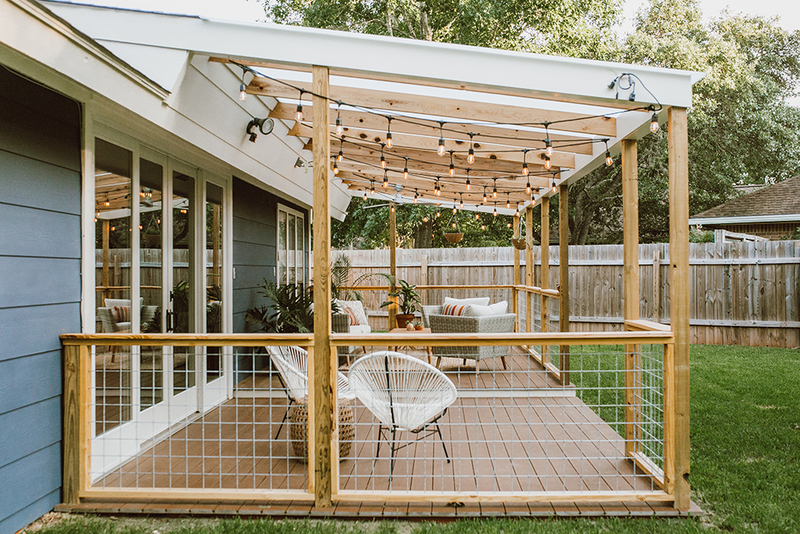 FENCING: I didn’t really look at any other fencing options besides chicken wire, I have been in love with this patio fencing style for a while! 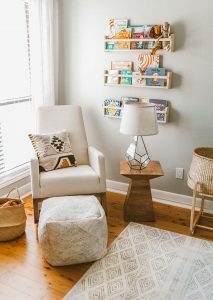 It adds such a cozy, home-y vibe to the space. Big fan! SLIDING GLASS DOORS: Given that sliding doors are expensive, we shopped around a LOT until we finally settled on the perfect brand for us. Blake and I sat down with a few folks in the door department over at Home Depot and eventually went with a custom build by Anderson. Interestingly enough, Anderson is not the cheapest on the market, but with the dimensions we needed, it ended up being the least expensive. Home Depot has a bidding system when it comes to certain doors and manufacturers can bid to get your business…which is why we ended up saving quite a bit by purchasing from Home Depot and moving forward with Anderson. This is in no way sponsored by Anderson or Home Depot (…umm, I wish haha! ), but Anderson has an incredible warranty on all of their products – which is HUGE considering doors will be used like crazy over time! SIDING + PAINT COLOR: We changed our vertical, light blue wood siding to horizontal, 12-inch hardy plank siding. The difference is seriously CRAZY gorgeous! We painted our siding a rich, deep blue color – we asked for Benjamin Moore’s Hale Navy but in BEHR exterior flat matte paint. Our trim is BEHR White Chip (we asked for an eggshell white). We went with BEHR because it has awesome reviews for exterior paint and our contractors highly recommended it… just our preference! We can’t even believe this is the same house after the siding + paint update…still in awe (and totally loving it) over here! 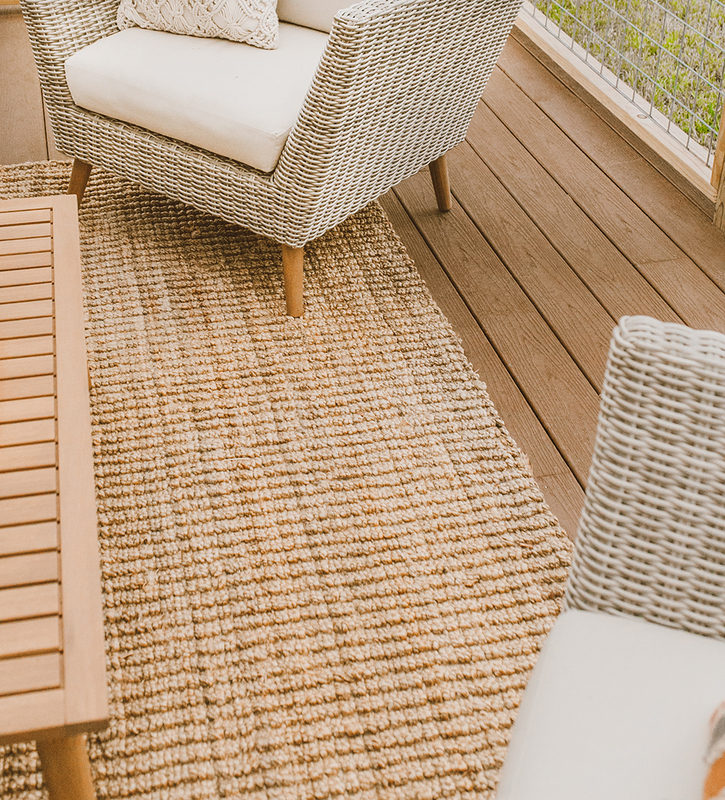 FURNITURE: If you want a closer look at our patio furniture and links to products, definitely check out this post. Our mid-century sectional is from Overstock, as are our white basket chairs, and the strand lights are from Costco (highly recommend! My whole family has these – they’re super durable and the bulb is that perfectly golden glow-y color…). CONTRACTOR: Finally, if you’re in Austin, I cannot recommend our contractor team enough!! David Ortiz Remodeling (David and Cretia) are absolutely incredible with ANY home projects. They completely transformed my moms’ bathrooms last year, so we brought them on for this renovation and are so pleased with their work. They’re extremely talented, reliable, so sweet and a joy to have around your home (…because trust me, you’ll get to know each other very well during home projects haha!). They generally have a lengthy waiting list, so I recommend contacting them asap (sometimes they’re booked even a year out). Can’t recommend enough! You can visit their Yelp page for contact info. 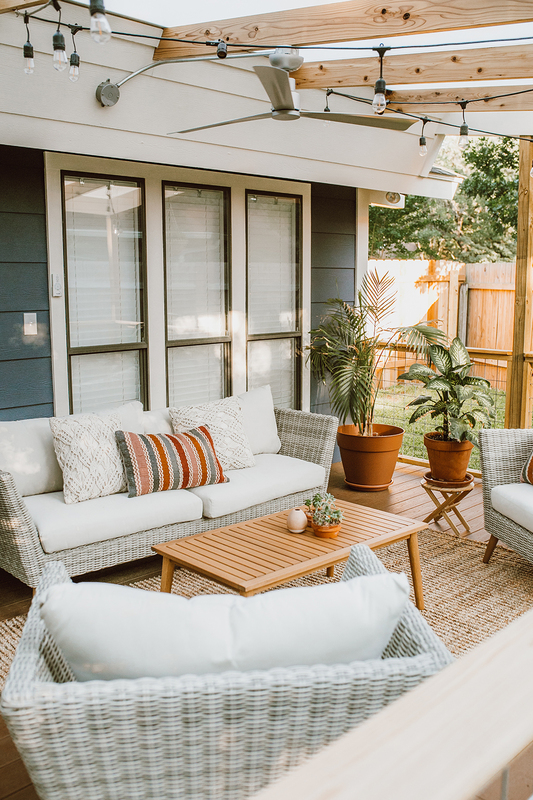 Before & After: Our Patio Reveal! 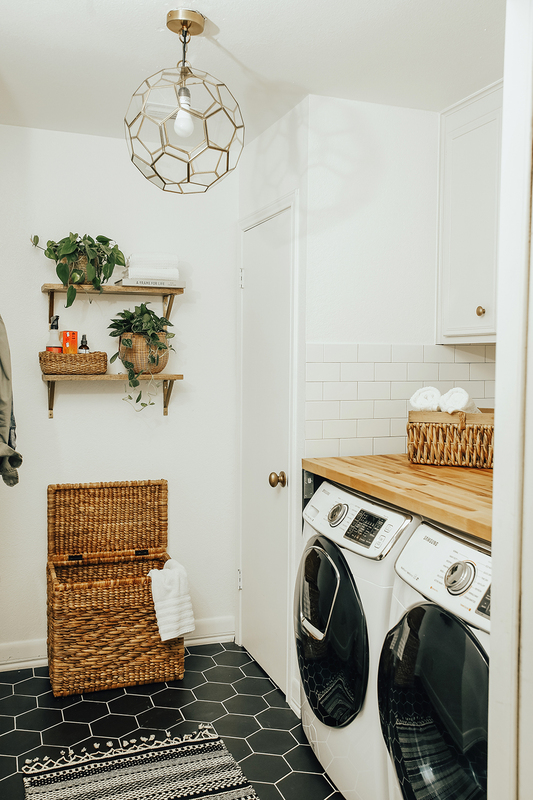 Baby P Nursery Reveal Before & After: Our Laundry Room Reveal! Great first video! 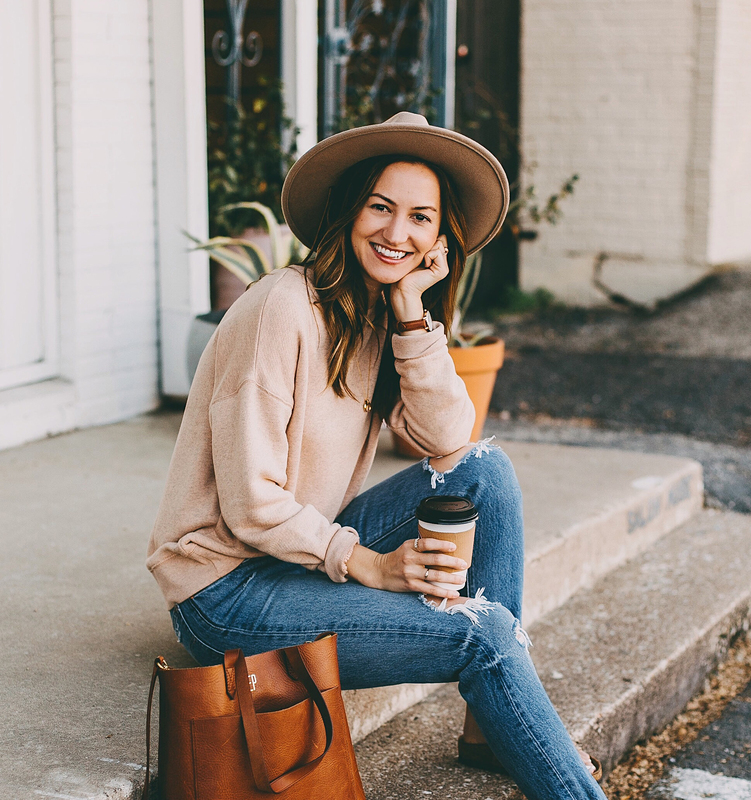 Looking forward to many more, as I love your style (fashion and home)! Congrats on the new video. Your patio is absolutely beautiful! My hubby and I live in Austin and are building a new home. The backyard is lacking so we’d love to do something similar to this, gorge! How much did this reno cost? So I can get an idea. Cheers! Hi Olivia – I echo Diana’s comment above. 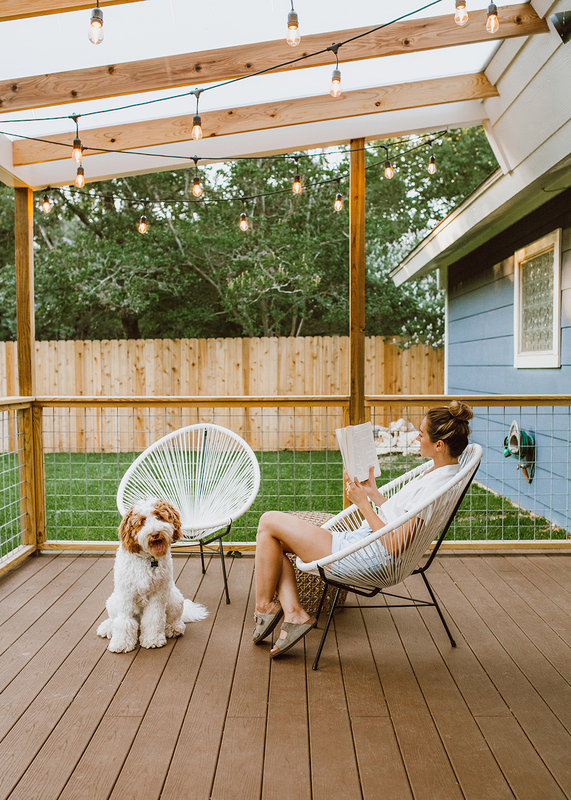 We’re in South Austin and our home and yard are shaped very similar to yours, and we are really hoping to add a porch like y’all did. Could I contact you for some info on pricing too? Hi Emma, of course! Feel free to send me an email: olivia@livvyland.com and I’ll share all that info! Where are the pillows from on the couches both inside and out? Love them! Help! I love the wire you used but can’t seem to find it. I’m in Phoenix, AZ so should be similar mats local. 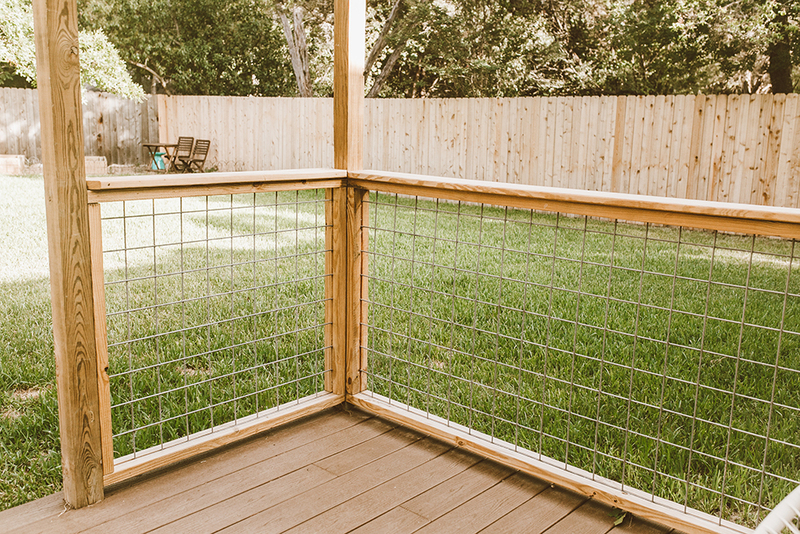 Do you have a link to Home Depot or Lowes or wherever you may have bought the fencing? Everything is in a roll and to me your material doesn’t look like it was rolled. Maybe I’m wrong? Hey Allison! I know our contractor team did most of their shopping at Lowes, so I’d assume it’s from there. The one thing I know they went to a lumbar yard for was the cedar planks. Hope that helps! !